"She may look like an angel... but she's a tramp!" 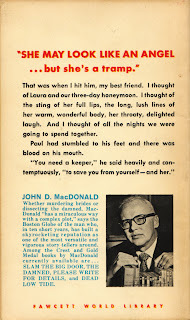 So screams the back cover of John D MacDonald's second novel, published in 1951. Right below that quote we read "That was when I hit him..."
But Dillon Bryant must have known something was wrong, because everybody has a problem with Laura. Bryant, know as Dil to his friends, is a 32-year old petroleum engineer, never-before married, who met the striking Laura Rentane at a party thrown by wealthy businessman and old pal Tram Widdmar. A week later the two were married. After a three-day honeymoon, Dil is back to work, sent to Mexico to hunt for oil. He can't stop thinking of his new bride: "Every time I shut my eyes I could see her silver-blonde hair, jet eyebrows, sooty smudge of lashes, sherry-brown eyes. I could remember so clearly the feel of her in my arms, the sting of those pouting, arrogant lips, every line of her tall, warm, wonderful figure... to hell with what other people thought of my Laura." Dil receives a letter from home (New Orleans, the only MacDonald novel to take place there), written by Jill Townsend, a newspaper reporter and ex-girlfriend, now a pal. Tellingly, he begins to describe Jill, on the very same page as the description of Laura, but with more tenderness and care than he did his wife: "We had a lot of laughs, a lot of fun. She's a little girl -- the top of her dark head reaches no higher than my lips -- but her slimness and the way she carries herself make her look taller. Her eyes are gray and sharp with intelligence, and her face is out of kilter in a funny way, the small chin canted a bit to the left, the left side of her mouth and her left eye set just about a millimeter higher than the features on the right side. It gives her a wonderfully wry look." When we meet a girl with gray eyes in MacDonald-land, she's usually the one. Jill's letter urgently tells him to return home as quickly as possible. Laura -- who Dil has asked Jill to look after while he was away (men... they just don't get it!) -- is in trouble, "the worst kind of trouble," and Dil needs to get back. By the time he returns to New Orleans, Laura is dead, murdered in their apartment. Even the police captain who Dil eventually talks to, and who has never met Dil before, can't resist remarking about Laura. "How come that floozy got you on the hook, Bryant?" he asks, before Dil tries to take a swing at him. "Ever notice the scars on her face?" he continues. "She put her age on the marriage-certificate application as twenty-four, Bryant. The doctor says thirty-five would be a better guess... You were suckered." We begin to learn a lot of strange things about Laura, including the fact that there is no passport record for her, her hair was dyed, and she didn't have a single picture of herself among her belongings. Dil eventually recalls her having a nightmare once and speaking in a strange language... it sounded like German, but Laura claimed she didn't speak German. How blind can love be? Jill takes the grieving Dil under her wing (Jill and Dil... 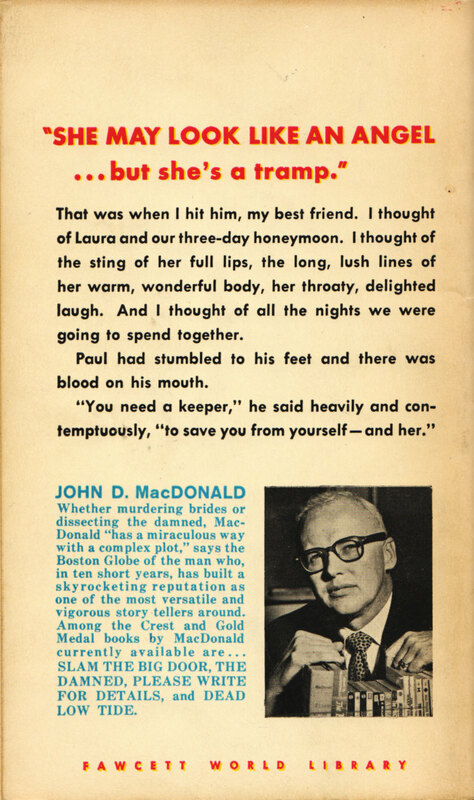 I wonder if MacDonald did that on purpose...) and relates the strange goings-on that took place in Laura's apartment after Dil left for Mexico. Visits from strange men and the smell of cigar smoke in the apartment when Jill came to check in on her. A dinner at a restaurant with a big blonde man she seemed to know well. A suddenly frightened Laura calling Jill and asking her if she had a place where she could hide. A man standing on the street outside the apartment building "like the villain in a Hitchcock film." Then her murder, strangled with a wire coat hanger. Dil finally says, "I want the man who did this. He's mine. He's my baby. My hands want him so bad they burn." He takes a leave of absence from work and begins his own hunt for the killer, with Jill assisting. "[Jill] frowned as she walked back and forth. I knew that she became unconscious of my presence. The lightweight, loosely belted robe slipped open. She hung a cigarette in the corner of her mouth, took a kitchen match from a brass dish on the coffee table, and popped it on her thumbnail. She trailed a cloud of smoke, and she looked like next year's debutante pretending to be a dead-end kid. Under the pajama top her breasts were high, conical, wide-spaced, quite startling abundant. I decided that for the few years I had known her, she must have been deceiving the public, and going around in considerable constriction and discomfort. She glanced down quickly and yanked the robe around her and belted it firmly." 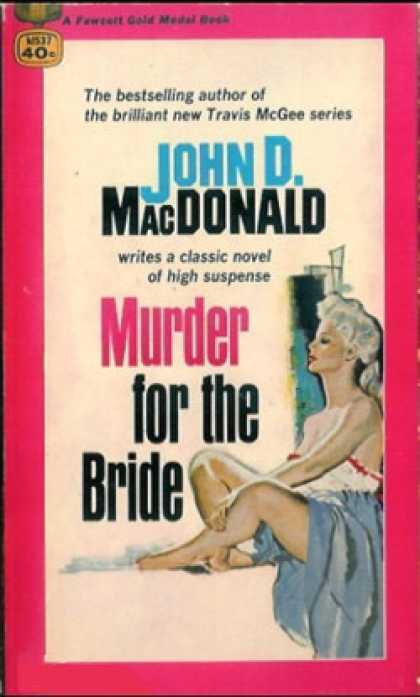 To MacDonald's credit, he doesn't allow the eventual romance between the two to come easily, and it is in doubt right up to the final page. Yet we know it's going to happen, even if it has to happen in a Fifties way, "the traditional way, even [the] ring." 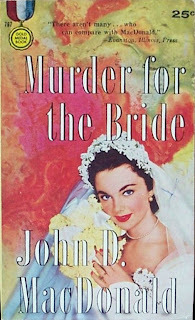 Murder for the Bride does not have the best of reputations, as anything involving communist spies in the Fifties seems to be looked down on as being part of the "Red Scare." Hugh Merrill, in his biography of MacDonald, dismisses it as "anti-Communist mania" and MacDonald's choice of subject matter as "a sure path to publication." 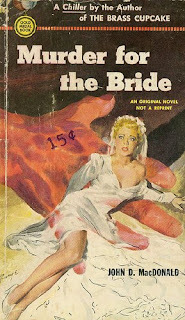 Yet, if you can get over a book with communist agents as bad guys (and, as we now know, the Red Menace was a very real thing), you'll find a great suspense novel with a racing plot and engaging characters. The book is currently out of print, but can be found used. 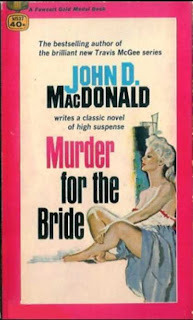 The cover I included at the top of this posting was found on the web and is one of the rarest of all MacDonald first editions. In 35 years of haunting used bookstores I've never seen it. I do own a copy of the later edition printed here.